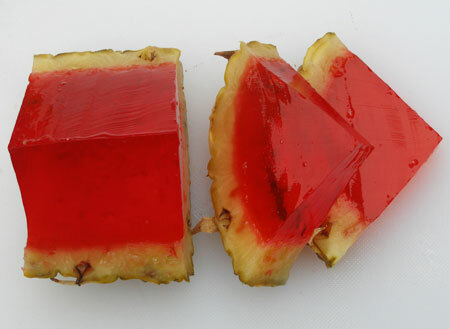 Note: If you can find the Piña Colada Jell-O, use it for this recipe instead of the strawberry Jell-O. Cut the top of the pineapple. 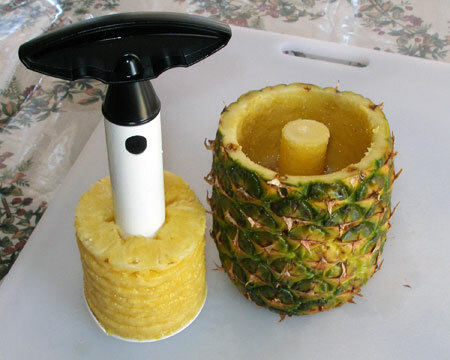 Using a pineapple corer, remove the flesh of the pineapple as much as possible without breaking the skin of the pineapple. 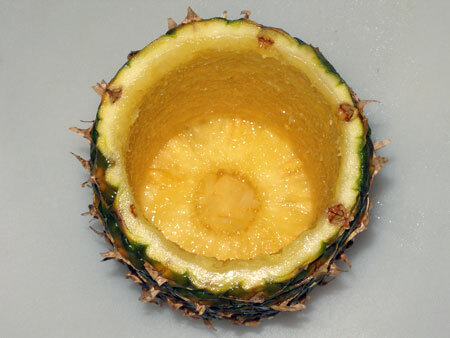 Using a knife, cut the core of the pineapple leaving the pineapple shell. Before cooking the pineapple, make sure there are no holes in the pineapple shell by pouring water and checking for leaks. Place the pineapple in a pan and fill it with water. Boil the pineapple for a couple of minutes. Note: You'll notice that the skin of the pineapple changes color when it's cooked. It will turn dark yellow. Why Do I Need to Cook the Pineapple? 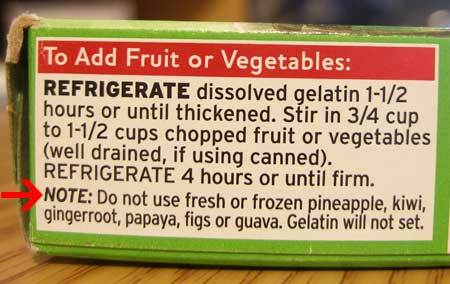 Warning: If you pour gelatin into an uncooked pineapple shell, the gelatin will not set. The Chemistry: Pineapple contains enzymes, called proteases, that destroys the proteins in the gelatin which causes the Jell-O to never set. 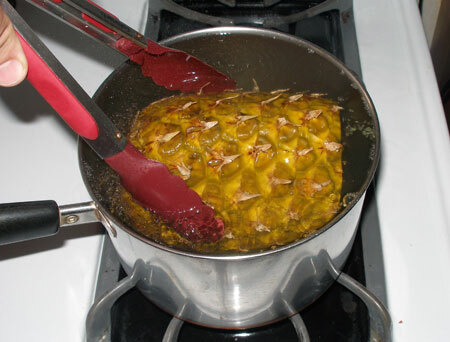 By cooking the pineapple, it inactivates the proteases allowing the gelatin to set. 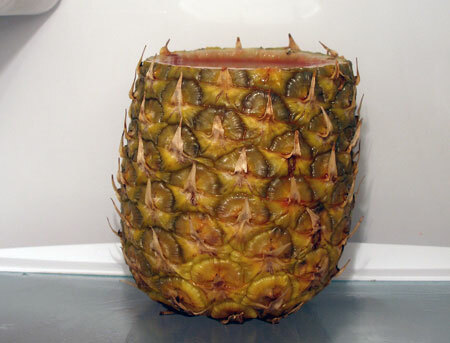 Fill the pineapple all the way to the top with the gelatin and place it in the refrigerator overnight or until firm. 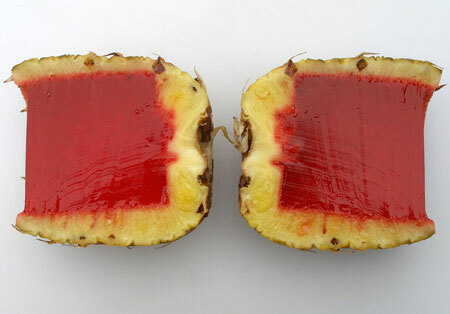 Once the gelatin is firm, cut the pineapple in half with a warm sharp knife. Then, cut the bottom part of the pineapple. Slice the pineapple halves into quarters. Using a warm sharp knife, slice the pineapple pieces into wedges. 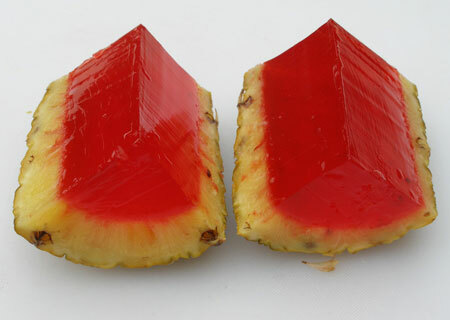 Place the pineapple jello wedges on a plate and serve. 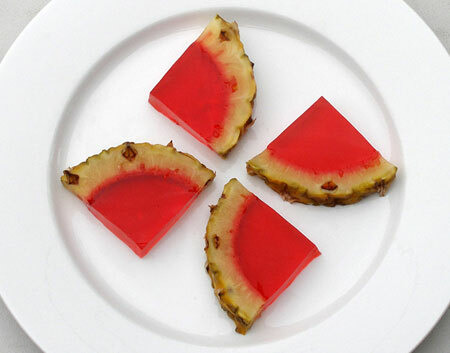 Note: The gelatin used in this recipe was the strawberry flavored Jell-O because I have not been able to find the Piña Colada flavored Jell-O.